As previously noted my primary objective this year is painting up a chaos/evil warband. These Chaos Hounds are part of that. GW’s hounds seem to have been cross bred/cross mutated with other species. As well as canine I can see boar, a hint of hyena and maybe even some lion in these, all with horny growths and minor mutations. My next regiment should be a unit of Chaos Cultists. These will be based on the Empire Flagellant boxed set with some kit bashing to lose the ‘Sigmar’s Sadhus’ feel of the original miniatures. 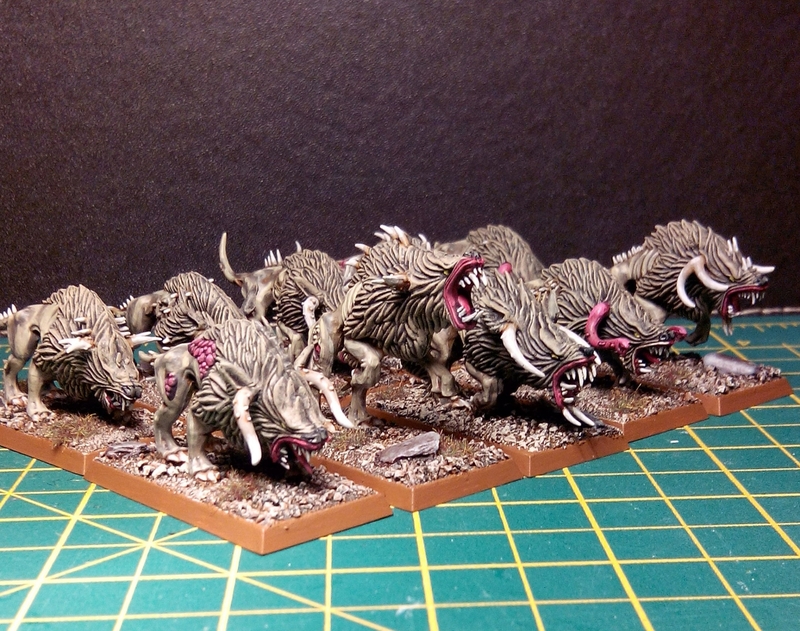 This entry was posted in Post-1990 and tagged Chaos Hound, Games Workshop on April 19, 2015 by Hobgoblin Orange. There’s a few people (and not just those who consider themselves ‘Oldhammer’ purists) that think Games Workshop is a mono posed plastic shadow of it’s former multitudinous metal self. Time and time again the cries go up when people of a certain age still interested in GW miniatures talk about today’s output from GW in comparison to the past. I can understand and empathise with all this. That’s perfectly fine. There’s something else I hear however that really does bother me. This is a false dichotomy. Most of those voices decrying the lack of individuality attributed to the modern models seem to forget that the original units sold specifically for Warhammer – the Regiments of Renown boxed sets – consisted of 8 identical troopers with only 1 choice of either Leader, Champion, Standard Bearer or Musician in the box. It was a fair few years later that some of those original packs finally included the whole range of command figures but still contained the 8 identical troopers. It didn’t improve much beyond that. Later boxed sets of regiments (such as Harboth’s Orc Archers or Prince Ulther’s Imperial Dwarfs) comprised of rank and file troopers that came from an identical standard model with small changes modelled in the armour, equipment, etc. This offered a little more individuality than the original mono posed Renown troopers but not a lot. The year is 1986. It’s April. America has just bombed Libya, GW have just released the Skaven, George Michael is at number 1 in the UK charts with ‘A Different Corner’ and we’re in a small Stockport shop called ‘Model Mania’ on a Saturday morning. The 14 year old me is rocking Nike squash trainers, cheap jeans bought from the market, a Vega cagoule and the beginnings of a mullet. My bmx is parked outside, sensibly padlocked up of course – this is the 80s not the 50s after all. The Sales assistant is only about 19yrs old but wears a checked shirt, brown tie, fetching green v-neck sweater with elbow patches, Farah trousers and sensible shoes. He looks very smart but I’m puzzled as to what his Father will be wearing today. The early mixed blister packs were a great marketing ploy to sell more figures, tempting you to buy more and start new units with the unwanted extras. Those 4 random dwarven crossbowers that came with the 20 dwarven axemen you actually wanted could surely be used as a new regiment if you bought a few more? Today GW does what it’s always done since the release of Warhammer in 1982, supplying regiments to use in the game. Yes, metal has gone except for a few ‘website only’ special items, notably 4 metal Chaos Warriors that in my opinion aren’t even in the top 5 of Jes Goodwin’s Chaos Warrior sculpts. The advancement of plastic technology and the prohibitive cost of metal have been mooted as the main reasons behind it’s withdrawal as their primary material. This makes perfect sense to me. Yes, blister packs have gone but how was that the best way to supply figures for a wargame anyway? They were a throwback to the days when fantasy miniature collectors changed from AD&D players buying individual figures for use on coffee tables with hex paper to a younger market spending pocket money on sets of figures for use in Warhammer 2nd edition. Because GW didn’t have enough of their own stores at this point to service demand these kids bought most of their gaming materials from other retailers wanting a slice of the 80s fantasy boom. These retailers expected higher levels of packaging production to put on their shelves than a set of fishing tackle trays used in the early GW stores to hold miniatures. Blister packs weren’t really suited to anyone assembling regiments yet their use persisted until recently. The costs to both the customer AND Games Workshop for the manufacture, picking, packing, shipping and stacking of all those little packages must have been tremendous and inevitably unprofitable compared to putting plastic sprues in a cardboard box. To me the advantage of modern units over the original metal figures, either blister packed or Renown Regiments is quite pronounced. There’s usually the chance to not only alter poses slightly, but also heads, weapons, etc. Not just with those that come in the box, but using alternative manufacturer’s bits too, adding much more interesting individuality. This level of alteration is way higher than what is considered Oldhammer’s crowning glory of regiments specifically for Warhammer – the boxed sets (Ruglud’s Armoured Orcs etc) that appeared from about 1987 onwards. Despite some pretty clunky sculpting these sets are considered by some to be part of the ‘Golden Age of Warhammer’, yet modern regiments that allow much more variation and show far superior sculpting skills evoke at best apathy or at worst snobbish derision from certain quarters. How so? I don’t understand the mind set of gamers or painters that look on Games Workshop today as some sort of Evil Empire intent on spoiling everyone’s fun and scamming money. Yes, all the humour left Warhammer years ago and was replaced by skulls. And then those skulls were replaced by skulls too. Let’s be honest though, the 1980’s GW humour was puerile schoolboy dross heavily reliant on puns based on the culture and celebrities of the time. Ian McGregor and Milk Marketing Board references have hardly stood the comedic test of time. ‘Da Orc Boyz are gonna poke doze stoopid Gobboes wiv dere spiky fings’. Oh how we laughed. Pass me another skull please – just as long as it wasn’t sculpted in this period by Gary Morley. And yes, there’s no reason now to buy another edition of the Warhammer rules when you’re perfectly happy with the version you own, or you have no desire to play a game in a GW store, or you’ve moved on to another ruleset completely. £45 for the latest rulebook and £30 an army book on top is a pretty expensive outlay for sure. If you don’t have a copy of Warhammer and fancy giving ‘Oldhammer’ a go try picking up a second hand copy of Warhammer 3rd Edition, Stillman’s Armies book and the two Realm of Chaos volumes that you’ll need on eBay. I doubt you’ll see much change from £150. Yes, there’s no need to buy their current paint range if you have the old one. If you don’t then Vallejo’s Model Color/Game Color, Cote d’arms and Army Painter ranges have many of the same colours at lower prices/larger pots. None of these are available locally to me to buy off the shelf. GW paint is, which I happily use because it’s a good product. The fact is Games Workshop still make some great figures usable as units in most fantasy games. True, not all ranges are good of course, for instance they haven’t produced a decent Ogre since Jes Goodwin’s C23 batch back in 1985, but that’s always been the nature of miniature figurine/toy soldier sculpting, you can’t win em’ all. Just how long they’ll continue to support the fantasy game in it’s current incarnation is also under speculation, fuelled by the ‘End of Times’ total annihilation of the ‘good guys’. However for now at least the entire range of modern Warhammer armies appears to still be in full production. Anyway, compare the following with the awful mishmash of Chaos Warriors they produced from the 80s & early 90s like Panedal, Kaleb Daark and pretty much the whole set of 1991 Chaos Warriors. These modern models look like the black hearted murder machines that Chaos Warriors should be. They’re much more befitting of the whole Chaos Pantheon they represent than some of the past cartoony efforts. 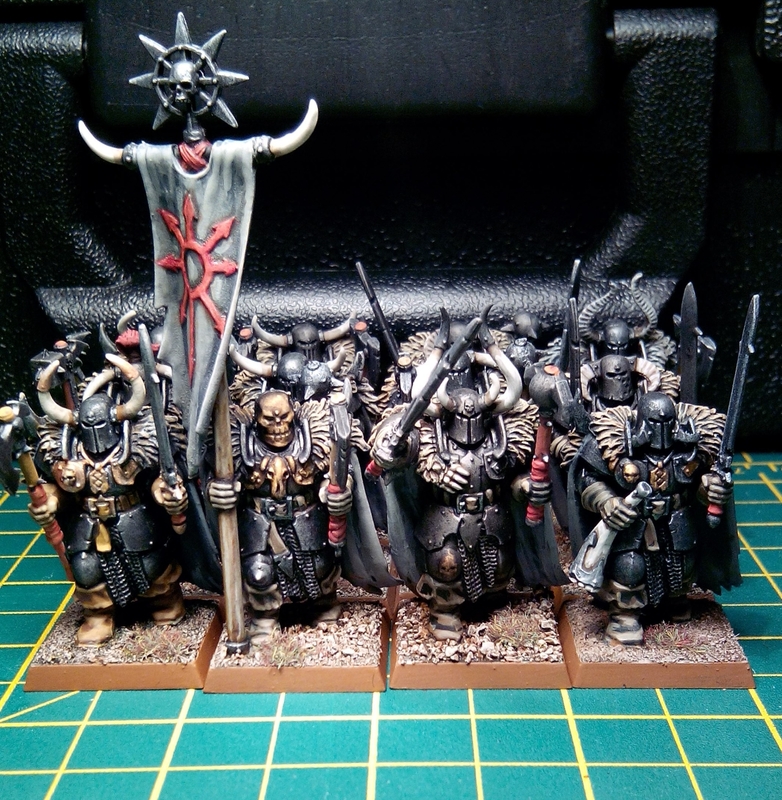 This entry was posted in 1985-1990, Post-1990 and tagged Chaos Warriors, Games Workshop, Jes Goodwin, Oldhammer, Regiments of Renown on April 8, 2015 by Hobgoblin Orange. I’ve been trying to concentrate on painting regiments rather than single figures lately. The reasoning is hopefully I’ll manage to have at least one completed small army/warband by the end of the year. Occasionally it’s been nice to take a step back in the middle of all this block painting and get the brush onto something a bit different. Although it’s important not to get too sidetracked by individual figures when trying to paint armies it’s only early April so there’s still plenty of time to get a sizable force of regimented troops painted and based if I (mostly) stick to the plan. 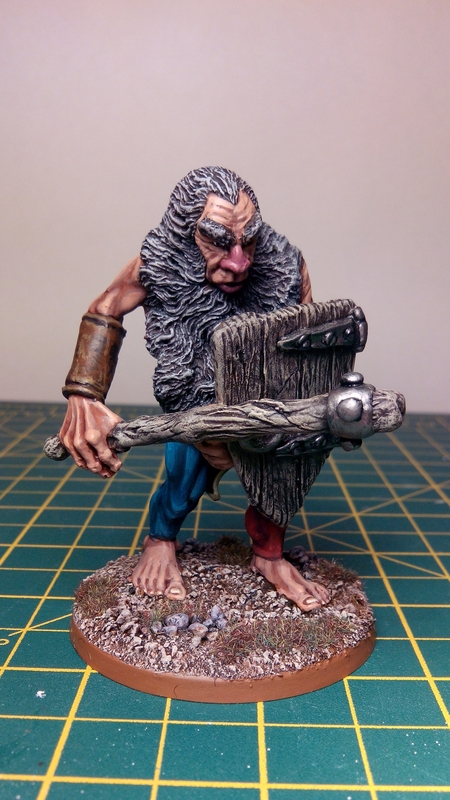 So with that in mind this is the converted Grenadier Storm Giant I blogged about last year. He was painted and based over four sessions or so, time spent not just on him but around waiting on regiments to dry etc. 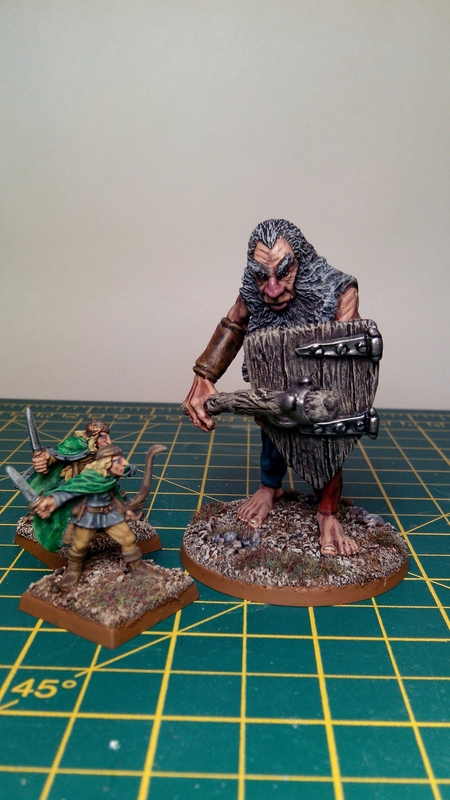 He’s painted up as a typically grubby giant, stood with a pair of 25mm Elves to give an idea of scale – Tom Meier sculpts from Ral Partha. All of these came in the same job lot of lead off eBay. I have plans for this old boy to join an Orc warband consisting entirely of Nick Lund sculpted Orcs, of which I’ve currently collected about fifty, with plans to add more throughout the coming year for my next fantasy project. 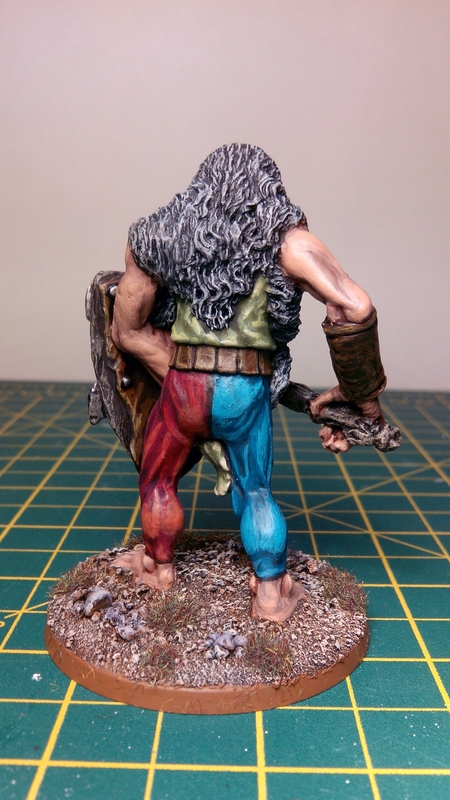 This entry was posted in 1985-1990, Pre-1985 and tagged Elves, Grenadier, Ral Partha, Storm Giant, Tom Meier on April 4, 2015 by Hobgoblin Orange.